This page created 1st July 2011. 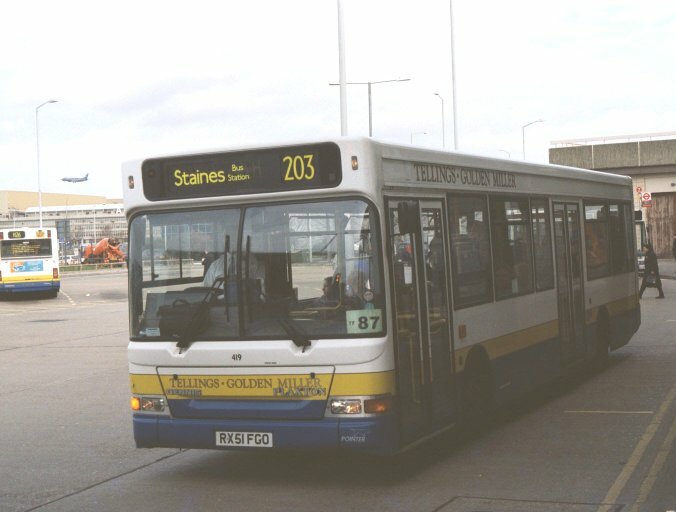 Tellings - Golden Miller had operated a coaching business as well as a few buses in the Feltham area before the prospect of tendering for London services came along. But that opportunity gained them route 235 (Brentford - Isleworth - Hounslow - Hounslow Heath - Feltham - Sunbury) in January 1998, for which they acquired fourteen Dart SLFs with 10.6m Pointer bodies with single doorways, seating 36. 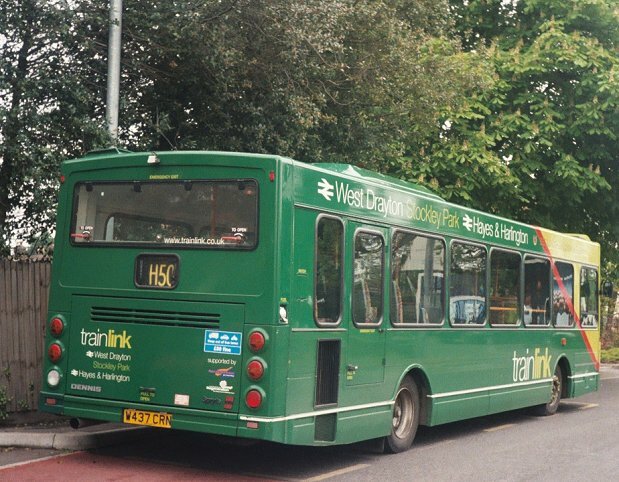 This batch stayed on the 235, moving with it to the new base in the old Tram Depot at Fulwell in April 2000. In January 2003 they were replaced on the 235 by newer Darts. 501-505 were sent to Eastleigh for a repaint into silver, and came back to Byfleet for use on a BAA-sponsored service to Heathrow, the 441 Heathrow - Staines - Englefield Green. For this they were given green route branding. They sustained the 441 until October 2006, when air-conditioned MPDs took over, becoming DP701-705 in June 2006. Three of them then went off to run the Kingston University services during the Christmas vacation period. 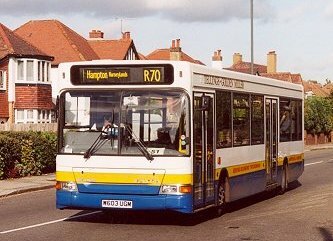 701 and 702 were displaced from there in December 2006 and should have gone to Travel West Midlands, but were turned down by TWM, so stayed at Fulwell. They became 8701-5 in spring 2007, and were repainted in the red & white Surrey livery, except for DP703 (8703), which donned all-red for its role as spare on the 152 from Beddington Cross depot. 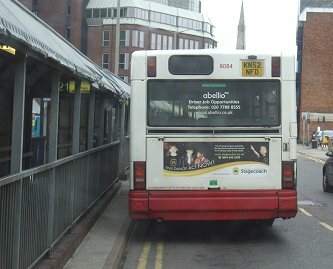 They were withdrawn and sold for further service at the end of 2007. 506-510 were given a repaint in spring 2003, retaining traditional white, blue and yellow, and returned to Byfleet for use on the "country routes" 218, 451, 461, 566 and 567 alongside the new batch of 8.8m MPDs. They were renumbered as DP706-710, and were repainted into red and white in 2006-7. Further renumbering in 2007 made them 8706-8710. These too, except 8708, were withdrawn towards the end of 2007 and sold for further service. 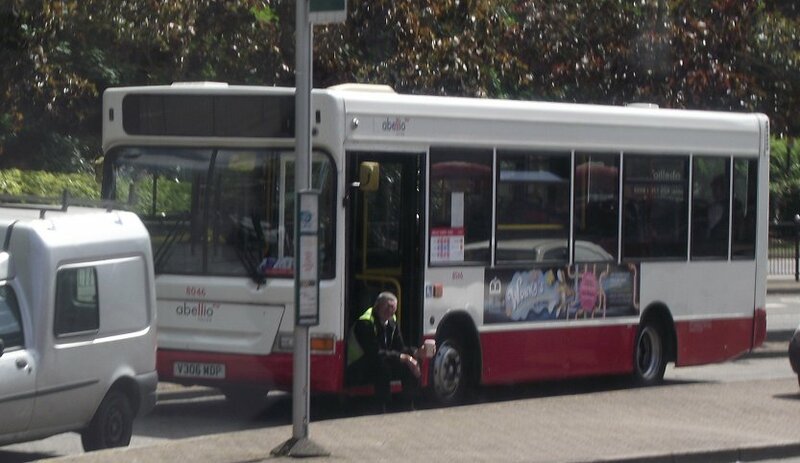 8708 continued in service at Byfleet as part of the Abellio Surrey fleet. 511-514 were declared redundant in January 2003, but very rapidly found a new home with MK Metro at Milton Keynes. Kingston University awarded T-GM a contract requiring three Darts in September 1998, for Roehampton Vale and Kingston Hill. 515 to 517 were 10.7m Pointer2s, as were 518 and 519, acquired at the turn of the year for a Surrey contract on the 471, (Kingston - Dittons - Esher - Hersham - Weybridge - Addlestone - New Haw - West Byfleet - Sheerwater - Woking) which had been given up by Arriva. These were in the same white/blue/yellow livery. 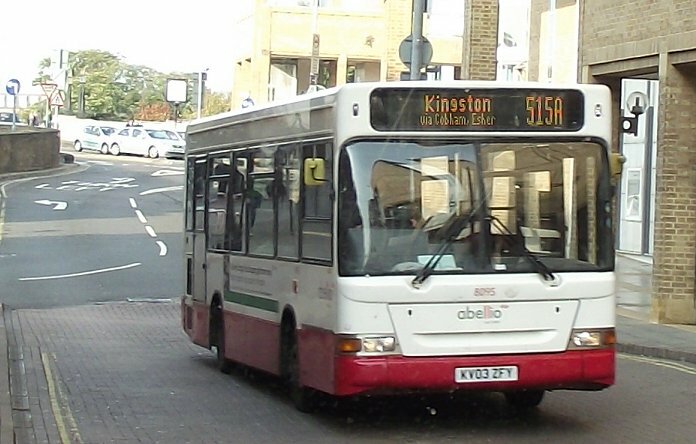 The Kingston University buses moved to Fulwell in April 2000. Their stint on the Kingston University contract came to an end in September 2006, when they (as DP715-7) moved to Byfleet for a repaint in the new Surrey livery of red with a white top, like DP718-9. But the stay of the Kingston trio was brief. They received new numbers (again), as 8715-7, in spring 2007, but were sold at the end of the year. Their country cousins, now 8718-9, soldiered on at Byfleet, becoming part of the Abellio Surrey fleet. 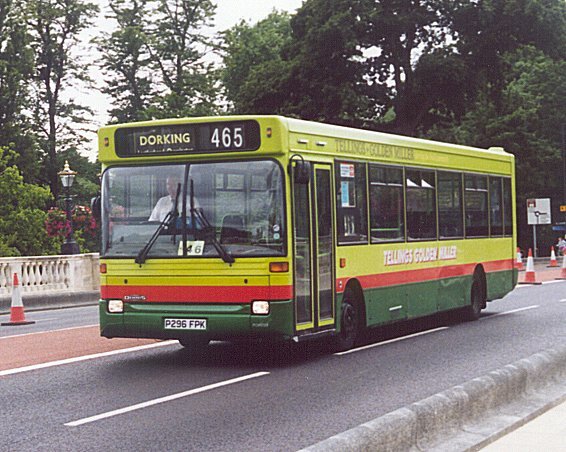 In May 1999 Arriva had to give up Leatherhead garage to its owners, and consequently found the 465 route (Teddington - Kingston - Surbiton - Hook - Leatherhead - Effingham / Dorking) impossible to operate effectively. They passed the contract on to T-GM, along with seven 10.6m "shoebox" Pointers that had been DSL90-DSL96 with London & Country. T-GM kept their green/green/red livery, but added prominent Tellings-Golden Miller fleetnames in white block italics shaded in red, plus a gold fleet-name on the cant-rail. The seven stayed with T-GM until July 2002, when they returned to Arriva Guildford & West Surrey. 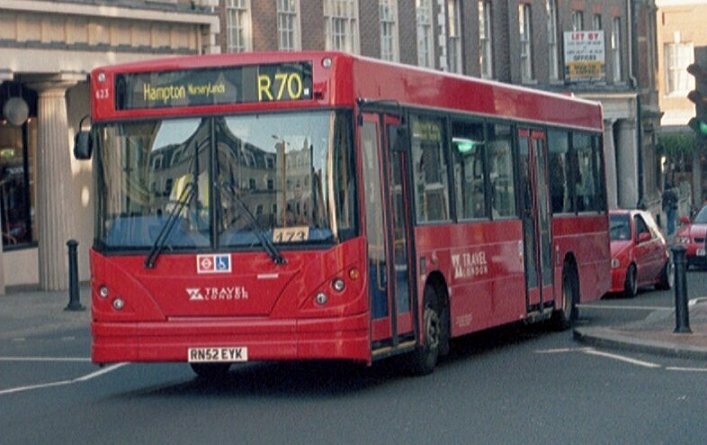 Hounslow route H20 was taken over from London United in November 1999. 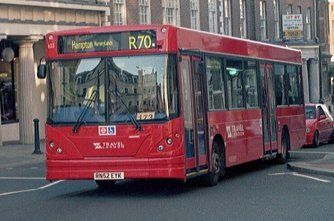 Nine new MPDs were acquired, which were used to equip the H20 (Hounslow & Ivybridge) and H26 (Feltham - Hatton Cross) (a former Capital Logistics route), replacing a variety of midibuses, from January 2000. As far as I can tell, the H20 initially operated out of the acquired Hounslow garage (from London & Country), and the H26 out of West Drayton. Both garages transferred bus operations to Fulwell in April 2000, when T-GM took over part of the Old Tram Depot there. The batch was repainted into red livery, with blue skirt and single yellow line, in the winter and spring of 2005. They were renumbered to DP41-49 in June 2006, and to 8041-8049 in March 2007. 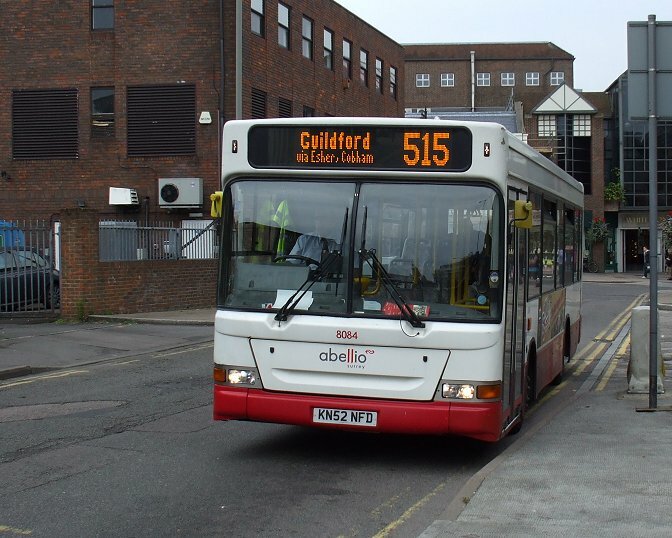 They continued as part of the Abellio fleet, some moving from Fulwell to Byfleet and acquiring the red/white livery. 8048 was withdrawn from Byfleet in July 2011 still wearing a blue skirt. 8046 - and driver - sits at Staines Bus Station on a quiet sunny Surrey Sunday in May 2011. 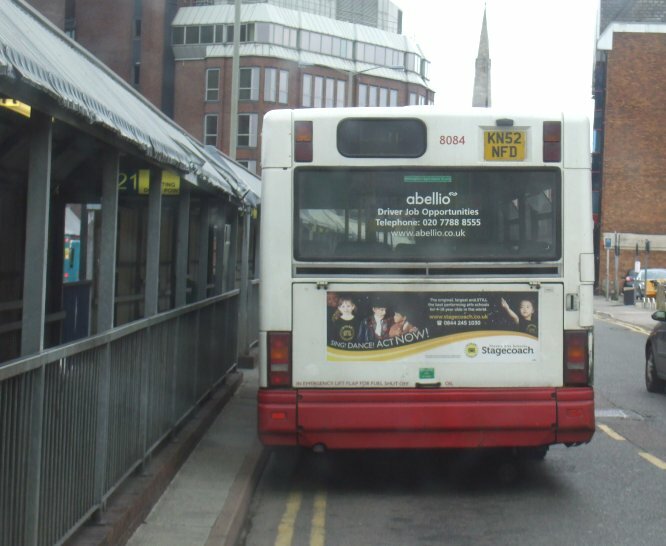 In February 2000 T-GM had a programme to fit wheelchair ramps to its Darts, and to maintain services hired three white Dart SLFs as cover: these were three 10.7m buses hired until April. Ten new Dart SLFs arrived in June in time for the take-up of route R68 (Hampton Court Stn - Hampton - Hampton Hill - Teddington - Strawberry Vale - Twickenham - Richmond), won from London United. These were medium length (10.1m), and dual-doorway. They were dressed in TGM's standard white, yellow and blue, with fleetnames moved up to the cant-rail. Modest route branding, giving major points in red, was carried on the yellow band on 403-410 but not 401 and 402. In November more substantial route branding was applied to 403-411, depicting people places and things associated with Hampton Court Palace, eg King Henry VIII, the Palace and the Maze. Again 401 and 402 were spared. All-red livery was applied in the winter of 2005-2006, followed by new numbers (DP4**, then 84**). The tip-up seats were removed, at TfL's behest. They lasted until September 2010, when they were withdrawn and returned to their lessor. 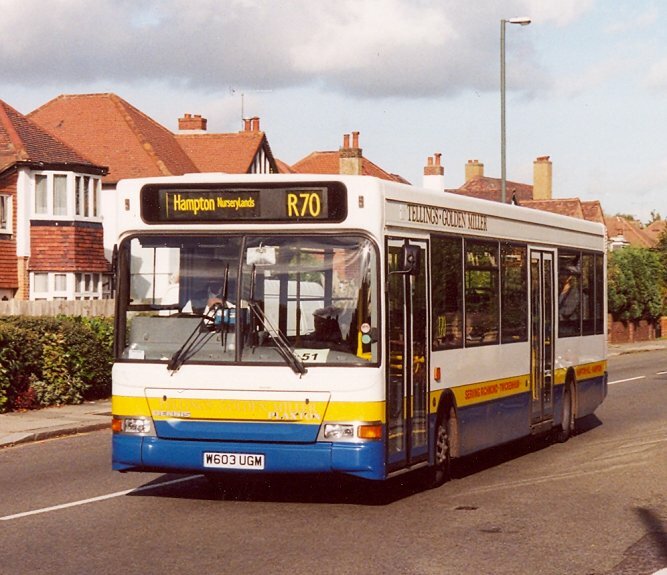 T-GM's take-up of route R70 (Richmond - Twickenham - Fulwell - Hampton - Nurserylands) was postponed from June to August because of the difficulty in attracting enough staff. Several of the buses were loaned to Green Triangle in Lancashire for a few weeks, while the others were kept in store at Scarborough until needed in mid August. The batch were eleven dual-doorway 35-seater long (10.7m) Pointer 2s, wearing standard T-GM livery. They went into red in spring 2006, and were renumbered as DP721-729, 731-732 in June that year. Renumbering as 8731 etc followed in spring 2007. They saw out their ten years at Fulwell, and were withdrawn in August 2010. Desultory use on rail replacement duties followed, and they were put up for sale by auction in July 2011. 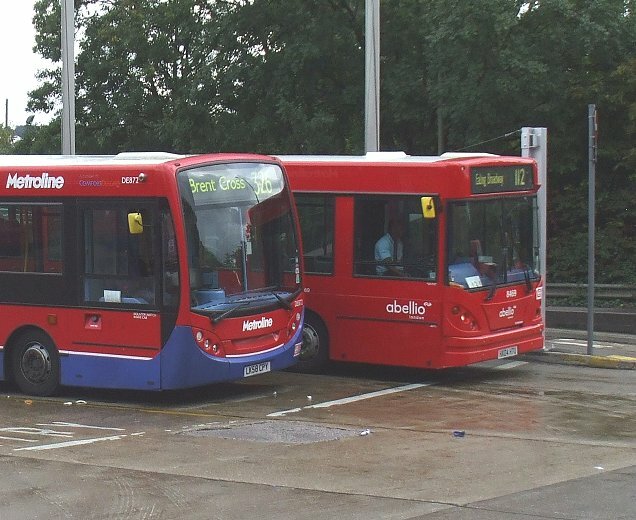 Eight more MPDs were delivered in December 2000 ready to go into service on the H28 (Hayes (Tesco) - Hounslow - West Middlesex Hospital - Osterley (Tesco)) in January 2001. They replaced the step-entrance Darts that had been on hire from London & Country since T-GM took over the route. Those were returned to Arriva Southern Counties. The new MPDs were similar to those already in the three hundred series, except that fleetnames were now up on the cant-rail to allow advertising, a trend being applied retrospectively to earlier Darts. All-red livery followed in 2006-7, as did renumbering, first to DP51-55, 57, 59, 61, and then to 8051 etc. They moved to Hayes, still with the H28, in June 2007. The events in Surrey earlier in the year having thrown bus service provision in the county into a series of rapid growths and failures, Tellings-Golden Miller acted cautiously, covering some failures temporarily, but keeping only those it could provide for. Nevertheless, it now found it needed extra stock. One found was a secondhand 10.6m single-door bus from Country Lion in Northampton, taken in June 2001. Its registration, N305DHE, did not fit neatly into the five-hundred series that its length and configuration called for, but it was eventually given the number 520 when the fleet was numbered in 2002. Travel London renumbered it DP711, but at eleven years old in March 2007 it was withdrawn into store, being sold at the end of the year. 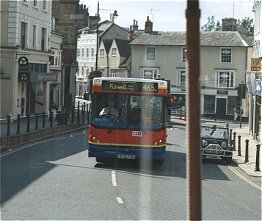 One of the routes that T-GM had kept was "Country" route 48 - totally outwith the London Country Area (Woking - Farnborough). To service this T-GM bought a pair of new Caetano Compasses in July 2001, and registered them in August with TGM plates: Y40TGM and Y50TGM. They worked from Byfleet. 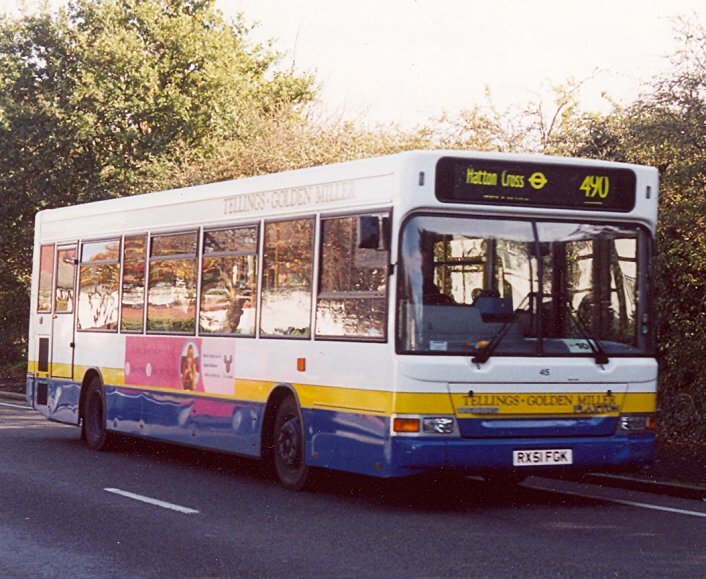 They operated the 48 for just over a year with T-GM, being sold with the route to Countryliner in September 2002. 323 was not an emergency extra, but a planned increase to supply the R62 (West Middlesex Hosp. - Isleworth - Ivybridge - Whitton - Hampton), based at Fulwell. It arrived in July 2001, and was registered in August 2001 as 1068MW, one of the last vehicles registered before the new registration system commenced in September. It was the only vehicle with R62 blinds, and had a slightly different seating layout (23+6 flops), so was kept rigidly to route! It was numbered 323 straight away. Travel London renumbered it DP58 (filling a gap in the series) in June 2006, and 8058 in March 2007. It was then reregistered (Y864KTF), allowing its previous plate (1068 MW) to return to T-GM (the continuing coach firm). It gained overall red too. Seven more 10.1m dual-door Darts came in September 2001 for the 203 (Hounslow - Hounslow West - Hatton Cross Stn - Bedfont - Stanwell - Ashford Hosp. 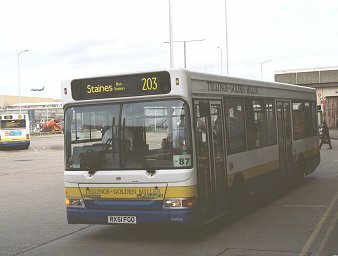 - Staines), which was taken over from London Buslines. 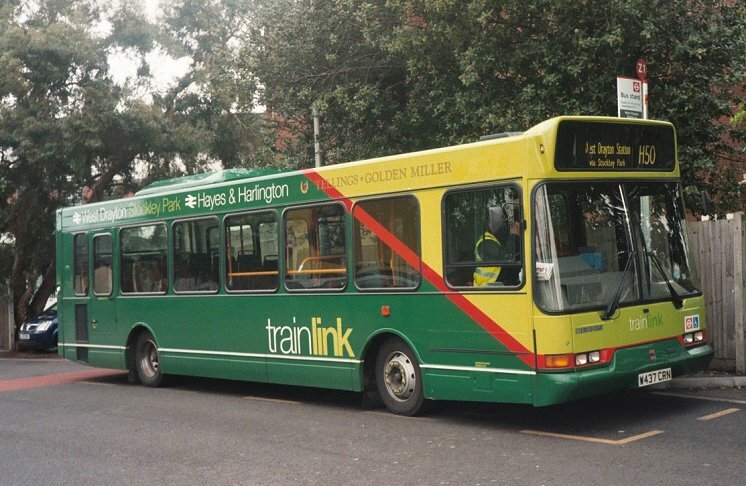 These were in standard white/blue/yellow livery, with high fleetnames, giving space for side adverts. They were also given fleet numbers, in black, as the old practice of using registration numbers was no longer workable. 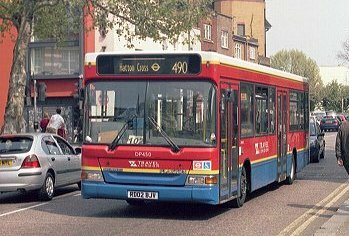 415 on Staines Road, heading for Hatton Cross on the 490, October 2001. 419 is at Hatton Cross, heading for Staines on the 203 in Feb 2002. Their sojourn on the 203 came to an end in September 2006, when as Travel London DP434-440 they moved to Beddington Cross to share the 152 with the ex-Wing's East Lancs Darts. Red repaints of course. They became 8434-8440 in March 2007. Tridents began to appear on the 152 during 2008, and some of this batch of Darts were transferred. Some went to Fulwell, then others were used as cover for i-Bus fitting at Hayes, and then to cover refurbishments among the Dart fleet.. In 2010 they regathered at Beddington Cross. A change of body-builder was evident for the follow-on batch of medium-length buses in November. 10.5m Caetano Nimbuses were chosen. One was displayed at the NEC in October. Perhaps because of this Caetano provided a demonstrator (X93FOR) for a few days. They went into service on the H25 (Hatton Cross Stn - Bedfont Green - Hanworth - Butts Farm). They were repainted all-red in 2006-7. The 2006 renumbering gave them DC type codes, and they became DC456, 457, 458, 454, 455, 459, and 453 respectively presumably to put the registration marks in order). The 2007 renumbering made them 8456 etc. They have stayed at Fulwell so far. December 2001 saw the arrival of another single Dart SLF, this one an Alexander-bodied Pointer2 MPD, for the 513 group of services from Byfleet. Numbered 324 on arrival, it subsequently became DP64 and 8064. In common with the other Byfleet buses it gained red and white livery, a digital display, and Travel Surrey, then Abellio Surrey fleetnames. February 2002 saw the sudden demise of White Rose Travel. TGM took over the hourly 218 (Kingston - Esher - Shepperton - Laleham - Staines), plus the Saturday only 400 (Staines - Shepperton) and the 566/567 (Staines - Knowle Hill). To resource this sudden increase in work T-GM hired in a selection of Darts from Dawson Rentals. (White Rose's own Dart SLFs had been reclaimed by lessors). At first the hired SLFs were a mixed bag of bodywork, with an Alexander ALX200, an East Lancs Spryte as well as Plaxton Darts. The "non-standard" hires were returned after a month or so, but more Plaxtons were hired, through to October 2002. Most were white, although there was one red one. Two long Nimbuses (11.7m) that had been with Amos of Daventry were acquired in May 2002, ostensibly for a pvr increase on the 235. But they were mostly used on the 465, 490 or Kingston University services. They were numbered 196 and 198 in line with their registration marks. 196 did not stay long, going off in September 2002 to Burton's of Haverhill. 198 stayed until October 2004 before going to Burton's. Meanwhile, Nimbus demonstrator X93FOR, which had been here before, and had recently returned from Metrobus, was loaned again by T-GM in July 2002. It went back to Caetano in September, then returned permanently as T-GM 193 in November, having been reseated from B25D to B31D. As a 10.5m bus it found a home on the 235. It wore red/blue/yellow/white livery initially, and the number 93. In August 2005 it went all-red, and was renumbered 193. The 2006-7 renumberings saw it become DC433 and 8433 respectively. Travel London withdrew it in September 2007, and it went off to a new home in Yorkshire. Twelve 10.1m dual-doorway Pointer2s arrived in June 2002, ahead of a batch of similar length Nimbuses. The Nimbuses were intended for the 465 (Fulwell - Dorking), to replace those belonging to Arriva Southern Counties. But with the Pointers arriving first, they went temporarily onto the 465, pushing the green Darts for a short while onto the 490, in turn allowing Optare Excels from the 490 to go onto the 216 (Kingston - Staines). A month later the Nimbuses arrived for the 465, and the Pointers took over on the 490, releasing the green Darts to go "home" to Guildford. The new buses sported a new livery, to comply with TfL's requirement for 80% red on the front and sides. They still had blue skirts, but the yellow was restricted to a pair of coach lines between the red and the blue skirts and white roofs. They also, rather oddly, had white rear corners. 443, now Travel London DP450, on the 490 in Richmond, April 2007. Pointer 443 displays the unusual rear end livery treatment at the 465 terminus beside the site of the old Dorking Garage, now housing, with just a bus stop lay-by to recall old times. They have stayed at Fulwell, although a couple went on loan to Dartford after the Crystals fleet had suffered a vandalism attack in July 2002. The last of the batch also took to wandering during the various refurbishment programmes in 2010-11. They adopted all-red at various times, and became DP441-452 and then 8441-8452 at renumberings in 2006-7. The red 10.5m two-door Nimbuses for the 465 duly arrived in July 2002. These too had the red livery with white rear corner posts and roof. They went into service on the Dorking - Fulwell route, which now once more sported London bus-stops all the way to Dorking. They were renumbered as DC460-465 in June 2006, and 8460-8465 in March 2007. Arriva took over the 465 in November 2007, and the Nimbuses were redeployed at Fulwell. The last two were repainted all-red and sent to Hayes in early 2008 to help out on the 112. 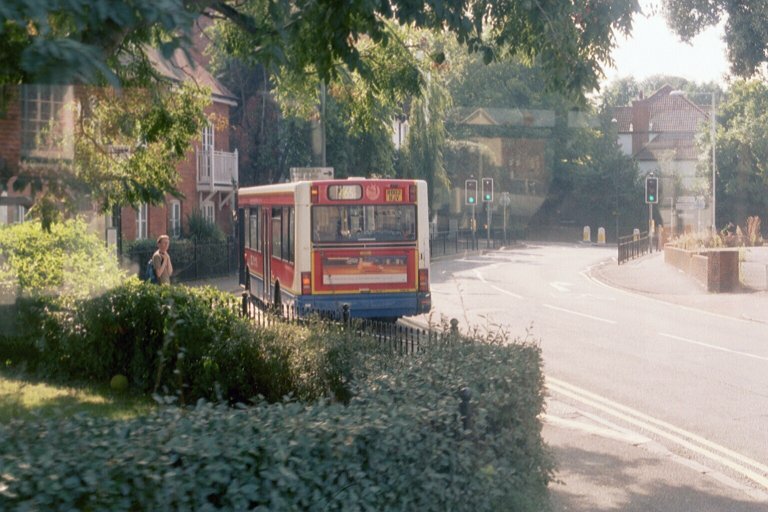 Red Nimbus 429 eases through Dorking at the start of the journey back to Fulwell (seen from an RF on the Dorking Running Day, Sept 2002. In September 2002 T-GM returned the collection of hired Dart SLFs from Byfleet, and hired thirteen older Pointers that had been at Armchair. These 10.0m buses arrived still in Armchair orange, black and white, but were given Tellings Goldem Miller fleetnames and numbered 477-489 (to go with registration numbers 677-689). They went to Byfleet for the "Country" group of routes: 218, 566, and 567 that the hired Darts had been servicing, and also routes 451 (Kingston - Staines) and 461 (Kingston - Woking) that were then taken over from London United. 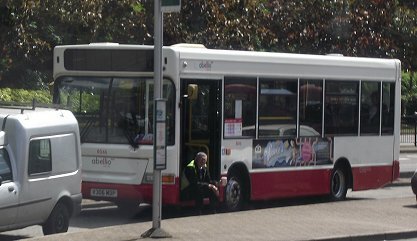 The ex-Armchair buses were just a stop-gap, while eleven new Dart SLFs were on order, and the older buses went off-lease in January 2003. These eleven 8.8m MPDs were for Byfleet's country routes, so came dressed in T-GM's traditional white with blue skirt and yellow band. They arrived when expected, in January 2003, and replaced the thirteen hired ex-Armchair buses. Renumbering made them DP75-85 in 2006, and 8075-8085 the following year. They received Travel Surrey red and white livery in 2007-9. They were released from duty by Abellio Surrey in the winter of 2010-11, and were returned to their lessor. Also in January 2003 route 235 was re-stocked. The existing 10.6m Pointers - T-GM's oldest - were reallocated to Byfleet to replace Varios, or sold to Milton Keynes Metro. The new order Nimbuses were a half-bay longer, at 10.9m, in "80% red" livery for this London Buses route. The 2006 renumbering put them in registration plate order, not following the original sequence, as DC733-753, and they then became 8733-8753 in 2007. 8733-8742 were swapped to Dawson Rentals in September 2010 in favour of ten Plaxton-bodied SLFs that had previously been with Armchair or Thorpes. 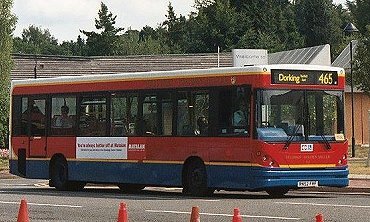 Nimbus 625 passes Dorking Halls on the final stage of a 465 working to Dorking, August 2003. In Travel London days 623, now in all-red livery, passes through Richmond on the R70, October 2005. To call 338 secondhand is to do it an injustice: it was well-travelled, although less than two years old. White Rose had acquired it new, for use on a Sainsburys contract in Surrey, although it apparently spent much of its time on White Rose's other Surrey routes. 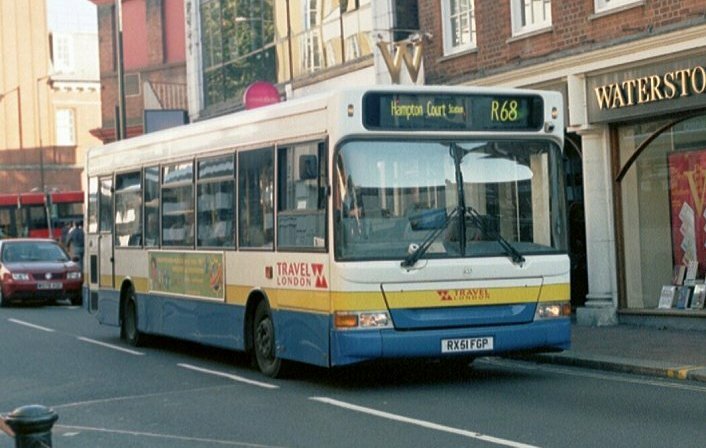 When White Rose folded suddenly in February 2002 it was acquired by Kent CC Transportation services, but was then acquired by Countryliner in September for their services 10 and 11 in Guildford. T-GM bought it in December 2002, and treated it to the red version of livery for use on the H26. It subsequently became DP62 and 8062. 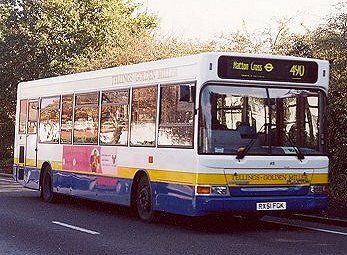 June 2003 brought yet more MPDs to Fulwell, with ten for BAA-sponsored routes 555, 556 and 557 serving Heathow Airport. Like the repainted early Pointers, these were in silver for their airport role, but with blue route-branding. They quickly acquired long side vinyls in blue and white, trying to present BAA and Heathrow as friendly to the environment. 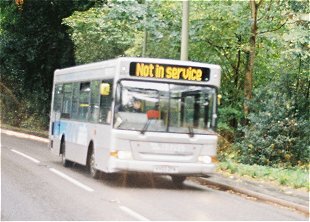 339 - 341 were reallocated to Byfleet in January 2005, still working the same group of routes. Another four, 342-345, were transferred across by Travel London in September 2005. The rest followed in early 2008. Renumbering made them DP86-95 and then 8086-95. They have gradually been repainted into standard Surrey red and white. BAA-liveried 8087 off-duty near Cobham in October 2008, now with digital display. Now in Abellio Surrey livery, 8095 enters Kingston on 515A, 23rd October 2011. 446 was an oddity in that it was a new Nimbus body, but not a new chassis. The latter had been a Dennis chassis demonstrator, new in 1998, now fitted with a new 10.5m Nimbus body for delivery in August 2003. Livery was the 80% red version, and it settled to work on the 235. It became DC455 and then 8466. It spent three months at Hayes in the winter of 2007-8, and went all-red. It then returned to Fulwell. 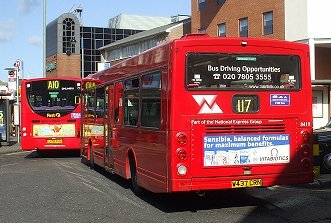 At the end of March 2004 T-GM took over Wing's Buses of Hayes Middlesex. With the company came seven 10.3m Sprytes on two routes, and ten MPDs on another route, as well as the Hayes depot. 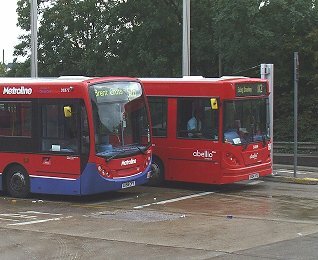 The 10.3m Sprytes dated from November 1999 and April 2000, and were in two distinctive liveries: the older three were in red, orange and yellow for route U7 (Uxbridge Stn - Brunel University - Hillingdon Hosp. - Hayes End - Charville Lane Estate. ), while the younger four were in two shades of green with red, for route H50 (West Drayton Stn - Stockley Business Park - Hayes & Harlington Stn). These had air-conditioning pods on the roof, too. W437CRN on the H50 at West Drayton Stn, April 2004, already wearing T-GM fleetnames. Renumbering in 2006 saw them become 8414-8420. The green four were repainted red by Travel London and transferred to the 152 in April 2006. New EnviroDarts arrived for that in December 2006, and two of the East Lancs buses (DE417, 418) returned from Beddington Cross to Hayes, displacing red/orange/yellow DE414, 415 to Fulwell for the Kingston University contract. DE419 followed, but DE420 went to Byfleet. The original orange three were sold in December 2007. 8419, previously DE419, leaves Uxbridge Station on the U7, October 2008. Wing's also had ten red MPDs on route E6 Bull's Bridge - Hayes & Harlington Stn - Greenford, which were duly taken over as T-GM's 349 - 358. In the meantime their operating base had shifted from from North Hyde Gardens to Springfield Road (April 2005) and back again (September 2006). The Travel London takeover resulted in their base code becoming WS instead of TM. The buses were also renumbered twice, first to DP65-DP74, and then 8065-8074. They stayed on the E6 until the loss of the E6 to Metroline in May 2007, when operation of the H28 was moved from Fulwell as compensation. 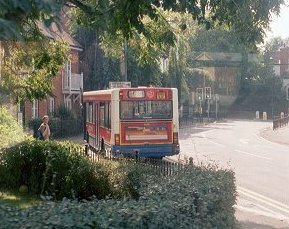 But their use on the H28 was brief, as the original H28 buses also soon moved across from Fulwell. They were transferred to Byfleet in August 2007, and began to be repainted in Travel Surrey red and white livery. They were also fitted with digital displays. But a year later, in August 2008, there was a short-term need for the take-up of TfL route 434, where the new buses were not going to arrive in time. Surrey livery and digital displays would not do for the three buses involved (8065-8067). They were repainted all-red, and fitted with roller blinds in time for their transfer to Beddington Cross. The new buses arrived, and the red trio became a float for i-Bus fitting, moving round Beddington Cross, Walworth and Fulwell as the fitment programme proceeded. They returned to Byfleet in February 2009. T-GM had earlier, in August 2003, taken over Crystals at Crayford, with its midibus fleet. 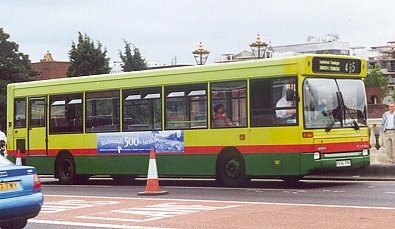 Now, in June 2004, the R2 was to be re-equipped with more substantial buses in the shape of 10.5m dual doorway Nimbuses. They arrived in early May, wearing a slightly modified red livery, with the blue skirt and yellow lines but without the white roof or white rear corners. 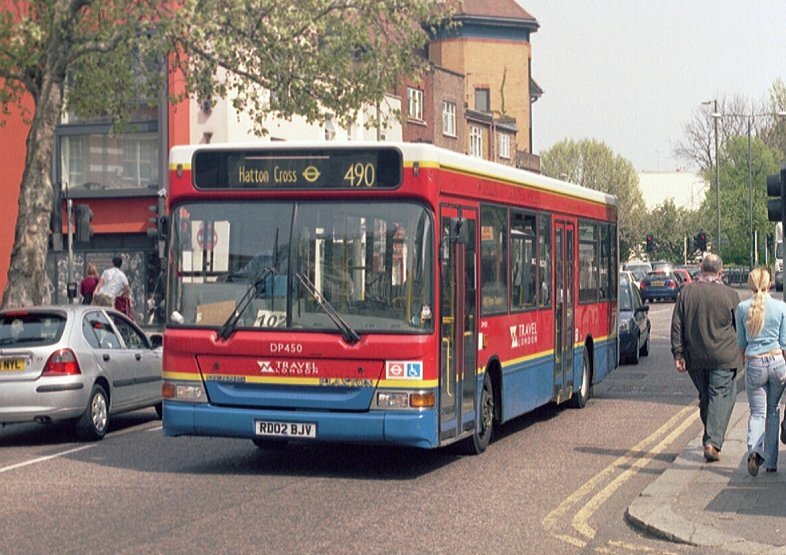 They transferred to Metrobus when the Orpington routes were taken over in March 2003. Six more of the Nimbuses arrived in May 2004. They arrived with numbers 451-456, which had been used to renumber the ex-Wing's Sprytes. 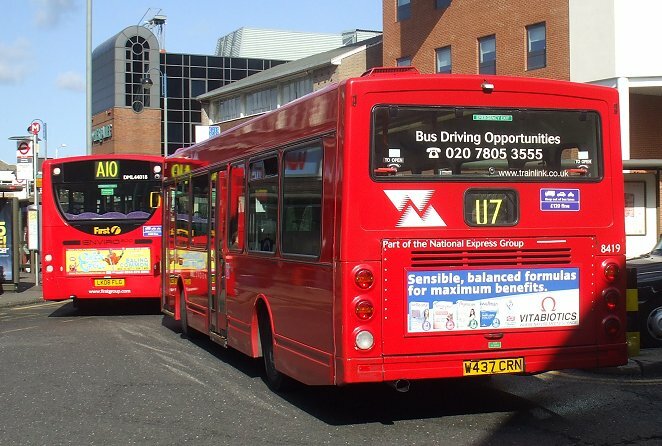 They were renumbered to match their radios, and registered in June 2004 for route 112 (Ealing Broadway Stn - Hanger Lane - Stonebridge Park, Neasden, Staples Corner - Brent Cross Shopping Centre.). They became DC467-472 in 2006, and 8467-8472 in 2007. 460, now Abellio London 8469, still on the 112 at Brent Cross in September 2010, in all-red livery. In October 2004 one of the long Nimbuses (198) went to Burton's of Haverhill, but a pair of MPDs came the other way, to Fulwell. These had been with T-GM before, as hires from Dawson Rentals for the Byfleet 218 group after White Rose folded. They were repainted into red with a blue skirt with single yellow band, ie no white roof, white corners or cantrail yellow line. They became DP60 and DP63 in 2006, and 8060, 8063 in 2007, based at Fulwell. The pair were withdrawn in September 2007, and returned to Dawson Rentals in December, only to re-appear with National Express' Hotel Hoppa at Heathrow from April to June 2008. Withdrawn again, they moved on, the former to Scarlet Band in County Durham, the latter to Imperial Buses in Essex. Travel London (part of National Express) had reappeared in London in February 2004, buying the Connex operations. In June 2005 they made another large bid for London business, taking over the London and Surrey bus operations of Tellings-Golden Miller. All the Dart SLF fleet was taken over, except the six with Link Line (61-66). Travel London immediately set about replacing Tellings-Golden Miller fleetnames with its own: white on red and red on white, and removed yellow bands leaving red and blue. A programme of repaints to all-red was started. The fleet was renumbered in June 2006, in a common scheme with the remaining ex-Connex vehicles and new Travel London ones, the Darts becoming DP, DC or DE according to Plaxton, aetano or East Lancs bodywork. But the new fashion in the industry was for big companies to have nationwide numbering schemes, and in March 2007 a new renumbering was started to bring the Travel London system in line with Travel West Midlands. Class prefixes were out, and the Darts received numbers in the 8*** series. 420 passes through Richmond on the R68 in October 2005, showing the new red fleetnames on the old livery. 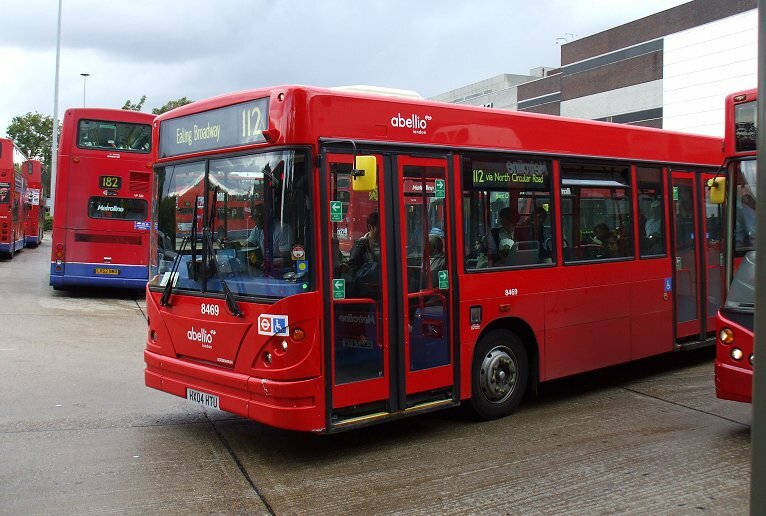 The operations in Surrey, outwith the TfL remit, were rebranded as Travel Surrey, and some buses received a livery of wine red skirts and white body panels, some with red roofs too. In May 2009 NedRailways took over the Travel London and Travel Surrey operations, with all premises, vehicles and routes. Rebranding as Abellio followed. Ian's Bus Stop Dart SLF index. T-GM SLFs. histories. photo refs.